Egypt's "liberal" (John Locke would beg to differ with the identification) opposition movement is a failure. The National Salvation Front's grandiose name does nothing to hide its gross limitations. This is a group that, notwithstanding the epic shortcomings of the ruling Islamists and the widespread disillusion of Egyptians of all types, is unable to make itself matter. It cynically expresses horror after recklessly egging on mayhem on the streets. 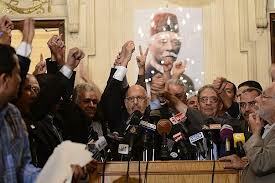 It finds political value in every passing tragedy, from Port Said to Cairo and back again. Its media outlets rejoice in disaster and loss, headlining each down day on the stock market (which, incidentally, increased by over 50% year-on-year in 2012) and tsk-tsking the inability of Egypt to find consensus in the face of their driven divisiveness. Its inept leaders are ever so brave in saying no, and utter cowards in ever saying yes to anything that does not fit into their zero sum political calculations. Egypt is capable and deserving of much, much more than this. NFW to the NSF. What to do with Egypt?